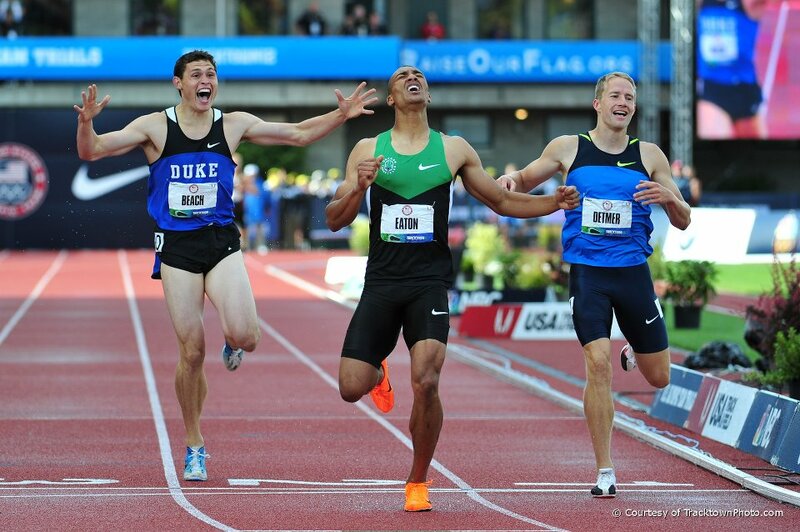 Ashton Eaton started in the Trials with a World record and ended with one. Are there other interesting world records to mention? Yes, here are some Eaton - statistics. Five of the best scores ever are from Ashton Eaton. Eaton was already world record holder since 2011 with 6614 points in his 8729 decathlon. Roman Sebrle is second with 6497 during his world record attempt in 2001. 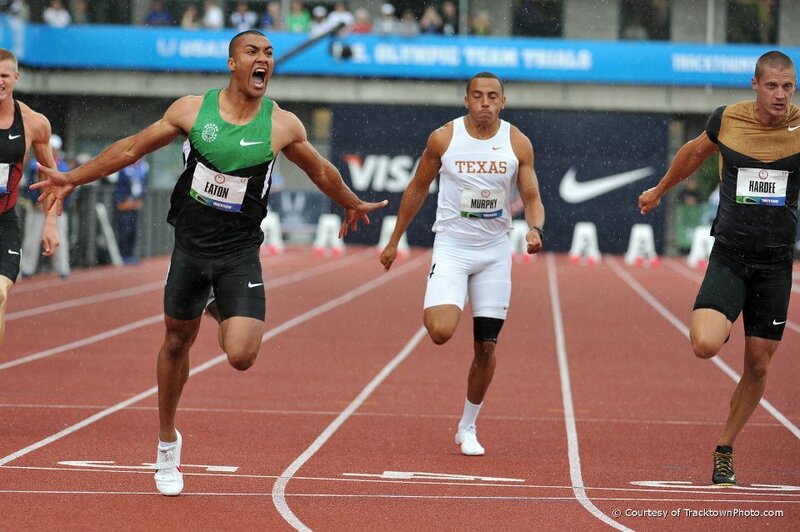 At the age of 24 nobody in the world ever had a personal best total as high as Ashton Eaton! Here are the totals of Roman Šebrle, Tomas Dvorak and Dan O'Brien to compare. Keep in mind that this are the totals at the end of the year that they became 25 years old. This means Sebrle at the end of 1999, Dvorak at the end of 1997 and O’Brien the end of 1991. Eaton will only be 25 in January of 2013 and his pb total already is nearly 200 points higher! In a previous article last week it was said that the sum of the personals bests of a decathlete in one year could probably give us some insight in the question in what year this athlete possibly was in the best shape ever of his live, also that “if Ashton Eaton runs 4 21.2 for the 1500 m on Saturday (23-06-12) he equals in only 3 months and 14 days the same one year personal best total (and world record score) from Tomaš Dvorak in the year 2000!” In fact it was 4 24.2 (my mistake) and that score to beat was 9154 but on his way to the world record Eaton did three all-circumstances-pb’s. His performances this year are now 10.21/8.23/14.62/2.11/ 45.68/13.34/46.14/5.30/60.26/4.14.48. So the shape he is in, is unseen before. It’s another world record score of 9308 points in less than 4 months. Good luck to you Ashton! Terrific info about a terrific athlete. I'll always remember the driving rain for the 400, compete with a mis-fire from a wet gun causing a further saturating of the athletes. You have pointed out how far Eaton is ahead of his opponents, especially in the running events. Let's not forget that though he has equalized the world record of 8000 decathletes in the 400m dash with 45.68, he in theory should be way better here. He has proven to have a great combination of speed and duration. in theory should be able to run the 400m below 45.00! Not that he'll have any reason to show it later in this year - but I guess he could. Here s a link to cool pictures of Eaton at US Trials. Check out the LJ and 400 in particular. YouTube video showing Eaton's first pole vault (10'6). While laughable, you can see his athleticism. Also apparent that he is a quick learner. It is funny that there is room for technical improvement even where he is already close to the best specialists in the world: 110 m hurdles. He actually uses what I'd call a "safe technique of a decathlete". He simply is too fast comes close to the hurdles and in order not to kick into the hurdle he swings his free leg elongated in a bow from right to left. His foot rises way too high, the side motion takes away speed and the elongated leg leads to "sailing" over the hurdles and landing way too far behind the hurdles. Once he can solve this, brings the right leg straight and slightly flexed kicks the leg down faster to pick up the speed and uses the body strenght of his musculature of trunk in order to pull his left leg directly after landing: 13,10 sec would be in reach. I'm not kidding his speed and flexibility would allow this. A Liu Xiang like elegance is out of reach and would not even be neccessary. Roger Kingdom in the 80ies proved that this technique works with brute consequence for someone with a muscular body frame. Eaton would have made the US long jump team and qualified for the pole vault final at the US Oly Trials, based on his 9039 performance at the same venue. Fantastic stuff very insightful, a must read for every real decathlon fan! Ashton had a new PR at Stanford, CA today in the shot put. He threw 15.40 for an increase of 38 points over his old pr. Ashton had a pr in the 400 today at Santa Barbara. He ran 45.64. Also threw the shot 15.02. Tomorrow he'll do selected Day 2 events at the Sam Adams Multi Event.